The Divine Thalassa Sea-front luxury suites and maisonettes is a newly-created VIP private neighbourhood drenched by endless Aegean views. Bathed in blue and green reflexions from the sunlight, this luxurious retreat is composed by luxury suites, maisonettes and villas ranging from 60 sq. m to 536 sq. m each, with sharing and private temperature-controlled heated swimming pools. The hotel offers guests the possibility to inter-connect sea-front suites upon request. Spelled by the rumour of the sea, this tranquil hideaway will live up to your highest expectations. 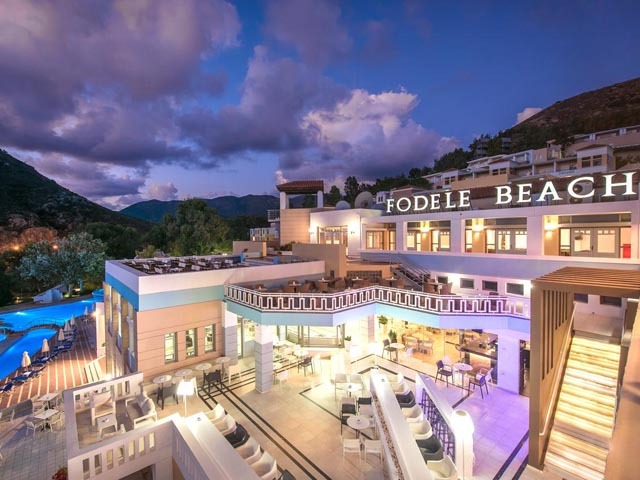 This 5-star deluxe resort hotel is located on a private peninsula, 20 minutes from the City and the International Airport of Heraklion and next to the traditional fishing village of Aghia Pelaghia. 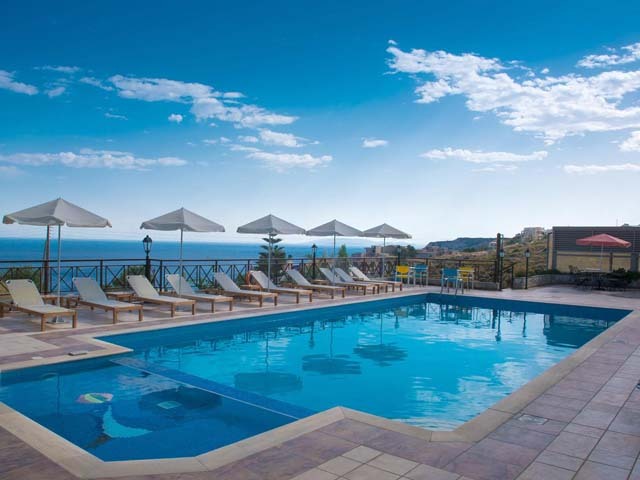 The 5-star deluxe resort hotel complex has been awarded with the 2008 Star Diamond Award and is ideally, centrally situated on the island of Crete, providing easy and quick access to all Ancient Sites for excursions. The property is outstretched over this unique peninsula resembling a Cretan Village and is surrounded by a Botanical Park of 167.000 sq. m. / 1.796.920 sq. ft. with beautiful Aegean views, extensive gardens, green pathways, ponds, cascades, a small river, 3 beaches and a private zoo. The property features 3 private greenhouses and large cultivations where organically-grown fruits, vegetables, herbs and flowers are produced and used in all restaurants and bars. Thanks to the environmental protection plan, private zoo, beautiful park and production of various goods, the resort hotel complex has been awarded with the Worldwide Hospitality Award 2002 for “Best Innovation in Terms of Environmental Protection”. Ideally located in the middle of this unique peninsula, Divine Thalassa provides guests with binding images that become memorable emotions. The epic landscape is unforgettable combining endless blue and expansive green. Ferry boats to Heraklion Port daily from the Piraeus Port of Athens. Automobile/Motorbike Rentals: There is a car and motorbike rental office in the resort. Guests can chose between 9 restaurants & 7 bars. A unique variety of dining areas and restaurants ideal to suit any mood and taste. Every meal can be a different experience, either in the many choices of restaurants they offer or even at the privacy of your room. Precieux Gourmet Restaurant Located next to the main Reception & lobby of the exclusive OH! All- Suite Hotel, this “a la carte” restaurant serves an exquisite French gourmet menu put together by the famous 2-star Michelin executive chef Eric Frechon (of the Bristol Paris Hotel). The restaurant operates during dinner hours. Make sure to ask the hotel sommelier to guide you through the Precieux cellar and introduce you to an extensive selection of vintage wines and champagnes collected and chosen especially from vineyards around the world. (100 guests indoors & outdoors). Safran Italian Restaurant Located right on the edge of the cliff of the OH! All-Suite Hotel, this outdoor “a la carte” pool restaurant offers a magnificent view of the Aegean, whilst serving Italian specialties for both lunch and dinner. The menu is put together by the Italian executive chef Gianluca Guglielmi. El Greco Gourmet Restaurant The restaurant is located at the lobby area of the RUBY RED Regal Hotel, overlooking the Aghia Pelaghia gulf, the RUBY RED Regal Hotel swimming pool and the St. Athanassios Chapel of the hotel amidst the colourful gardens. The El Greco Gourmet Restaurant provides an imposing environment and excellent service and offers an outstanding “a la carte” menu with a wide choice of Greek gourmet specialties for dinner accompanied by the soft sounds of the pianist. The menu is put together by the famous 2-star Michelin executive chef Arnaud Bignot (of the awarded Spondi restaurant in Athens). (260 guests indoors & outdoors). Knossos Private Restaurant Located at the RUBY RED, Regal Hotel this stylish restaurant features two dining rooms connected with an atrium, glass front doors to allow the lovely view of the sea and the gardens and a spacious front veranda next to a waterfall. Wall paintings inspired by the frescoes of the “Knossos” Minoan Palace, crystal chandeliers and antique furniture compose the unique style of this restaurant. The hotel offers a choice in International and Greek dishes, serving daily American Buffet Breakfast and Silver Service Dinner with the first course and Cheese presented in Buffet style and the choices of Main Courses and Desserts served to guests. Guests booked at the RUBY RED, Regal Hotel and the Eternal Oasis Neighbourhood on a half board basis will have their meals in this restaurant. Only children over the age of 10 are permitted in this restaurant. (650 guests indoors & outdoors). Poseidon Fish Taverna Decorated and furnished with a Greek regional flair, this restaurant is a traditional Cretan fish taverna. It is located right next to the beach of Aghia Pelaghia, overlooking the Aghia Pelaghia picturesque fisherman’s village and the crystal clear sea. The restaurant offers an “a la Carte” Greek cuisine menu for both lunch and dinner, in an informal and relaxing setting, where you can experience the authenticity of Greek dining. The menu features the fresh catch of the day, a variety of the famous delicious Greek “Meze” along with a large selection of the finest Greek wines and spirits. (620 guests indoors & outdoors). H2O Aqua Fusion Restaurant Located at the pool area of the Crystal Energy Hotel, this restaurant serves a fusion cuisine with Asian & International specialities. Don’t miss the daily water-music-light show from 9 – 9.30 pm which is certain to enchant you! The restaurant operates during lunch and dinner hours. Raki Cretan Restaurant This brand new restaurant is located at the Crystal Energy Hotel at the ground floor and operates inside & outside offering magnificent sea views. It operates only for dinner and it offers traditional Cretan dishes and specialities, desserts, wines & spirits. (80 guests indoors & outdoors). Red Pepper Mediterranean Restaurant Located below the lobby area of the Crystal Energy Hotel, this restaurant is the main buffet restaurant of the hotel and offers a wide variety of salads, starters, main courses and desserts from various locations worldwide. The restaurant has a beautiful veranda overlooking the hotel’s Cladissos Private beach and bay. The restaurant is available during dinner hours. (200 guests indoors & 80 outdoors). Enjoy soothing cocktails and excellent spirits in one of the seven bars of the OUT OF THE BLUE, Capsis Elite Resort. Precieux Bar Located at the OH! All-Suite Hotel, this bar offers a unique and luxurious environment where the VIP guests can enjoy premium brands and luscious cocktails. The furniture and decorative items by the Italian Collections of Boffi and Murano astound offering overwhelming experiences. The bar extends to a beautiful veranda, overlooking the sea and hotel gardens. (10 guests indoors & outdoors). Ikaros Lobby Bar Located at the RUBY RED, Regal Hotel, this bar offers an especially cosmopolitan environment by the Hotel Lobby, inviting the guests to enjoy pouring brands and delicious snacks and desserts, throughout the day. The outdoor veranda is surrounded by colourful gardens thus turning a brief “get away” to an unforgettable experience. Browse through an exclusive selection of cigars and savour the brand of your choice! Children over the age of 16 are permitted in this bar where Live Soft Piano music, 6 times per week, will accompany your get away. (120 guests indoors & outdoors). RUBY RED, Regal Hotel Pool Bar Located at the RUBY RED, Regal Hotel main Pool this bar serves occasionally throughout the season only for the RUBY RED, Regal Hotel guests. Offering refreshing juices and cocktails this bar offers relaxation moments and captivating sea views (300 guests outdoors). Azure Pool Bar Located by the Capsis Oasis Neighbourhood next to the Eternal Oasis Pool, this bar is serving drinks, beverages and light snacks daily during the daytime. Enjoy relaxing moments surrounded by the lush gardens of this beautiful Oasis. Aqua Marine Beach Bar A relaxing beach bar located on the Cladissos Beach offering delicious snacks, delightful desserts and a large selection of fresh fruit juices and beverages. It operates only during the summer period, daily during daytime. Cladissos Cliff Bar Located on the cliffs in front of the sea, next to the Cladissos Beach and under the Crystal Energy Hotel, this bar operates only during the summer period and for private functions, cocktails and receptions. Euphoria Rejuvenating Spa Bar Located at the lounge area of the Euphoria Rejuvenating Spa, next to the hydro therapy pool. Take some time off to experience a unique spa located at the exclusive OH! All-Suite Hotel and refresh your taste buds with a light menu serving aromatic delicacies and beverages from around the world, especially created to re-enforce your body and mind. Hot Spot Bar Located at the Crystal Energy Hotel, this bar offers an especially fun environment featuring a unique virtual bowling and video games area. You are welcome to enjoy delicious snacks and desserts throughout the day allowing yourself to feel free and play like children! Dazzle Bar Located at the Crystal Energy Hotel, this brand new disco is the absolute place for fun, dance & entertainment offering alcoholic & non-alcoholic drinks & various kinds of beverages. (40 guests indoors & 60 outdoors).